Scrumpy & Western website. Made In Somerset from cider! The Bob Barrett page. Bob Barrett is one of the un-recognised pioneers of Scrumpy & Western music. He was drafted in by EMI as the sound engineer to record Adge Cutler & The Wurzels appearance at the Royal Oak in Nailsea in 1966. 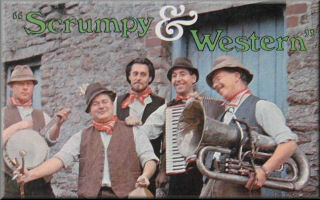 The resulting album - the iconic Adge Cutler & The Wurzels LP, he also produced. He continued to work with Adge, and on the second album, he is given songwriters credits (well, an adaptation) on the tracks The Wild West Show and Freak-Out In Somerset. He continued to produce all their albums and singles until EMI terminated their contract with The Wurzels in 1980. This last work was the Drunk On A Saturday Night single released in Feb 1980. Bob also composed a number of Wurzels songs over the years - and was an important cornerstone in the Wurzels story. In 1985 he left EMI, and set up his own label, Grasmere Music, concentrating more on 'English' music - ranging form brasss bands to folk. Amongst his releases on Grasmere are several of the later Yetties' albums, showing his retaining his interest in Scrumpy & Western music. As announced in the Wurzelmania! News at the time, Bob passed away at the age of 65 on Monday 26th January 2004 after losing his battle against cancer. This is a nice piece written in Songwriters International website (Mar/Apr 2004 archives): Veteran producer Bob Barratt died on 30 January 2004, aged 65. The long-serving EMI producer and A&R man worked with artists as diverse as Max Boyce, Vince Hill and The Wurzels with hits like Vince Hill's version of Edelweiss and The Wurzels No. 1 Combine Harvester (Brand New Key). In 1985 he set up Grasmere Records, concentrating on releasing traditional brass bands and organ music. He chaired the British Academy's Gold Badge Committee for many years and was himself awarded a surprise Gold Badge in 2002. Barratt spent the last two years of his life fighting liver cancer and leaves a wife and three daughters. His funeral took place on February 9 at Surrey and Sussex Crematorium. From the Yetties website: This name may not be familiar to you but Bob Barratt owned and ran Grasmere Music (Grasmere Music Ltd, 59 Marlpit Lane, Coulsdon, CR5 2HF), the company for which we recorded seven of our CDs. Jim Lloyd, our manager from many years ago, put us in touch with Bob back in 1992. We kicked off with the 'Barn Dance' recording and things developed from there. Bob passed away back in February and he will be greatly missed on the music scene. When we were recording for Argo/Decca back in the 70s he was working for EMI and on his books he had groups such as The Wurzels so his connections with the West Country go back many years. He was an expert on such diverse subjects as publishing copyright and bus routes. When we had finished a recording session he would quite often hop on a local bus and have a wander through the countryside, the longer and windier the route the better. He also had a great love of The Scilly Isles and spent some holidays watching the whales off Alaska. In short, he was a very diverse and extremely intelligent character. His daughter, Jo, is running the company at the moment. Best of luck me dear, you've got a hard act to follow.